Many experimental bodyboard designs were springing up in the late 1980s. The short-lived Ahi Board was one of them, claiming to be "the revolutionary new shape in bodyboarding". 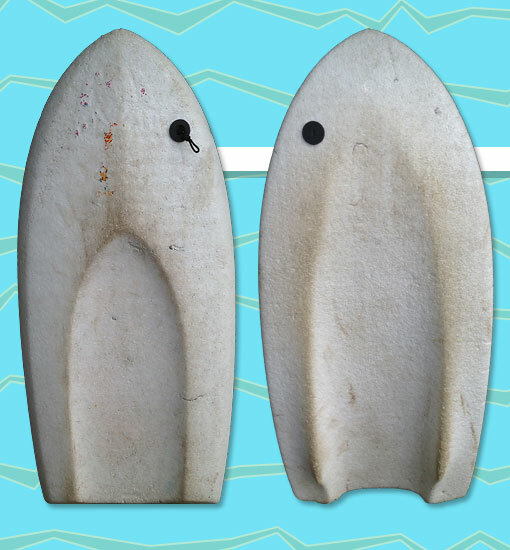 This obscure and very rare board featured a futuristic look with fins molded right into the channel bottom. The Ahi Board was made of "state of the art Arpro foam" (molded polypropylene beads). Although this particular board appears to be bare white foam, the Ahi Board was came in a variety of tropical colors. Photo: Dina Barton.